Recently my delete key stopped working. I don’t know why. It just doesn’t work any more. Until that happened, I never realized how often I use it. This turns out to be fortunate for my readers. Trust me. There’s a lot of bad writing that y’all never see, thanks to the little delete key. I think I’d like to have a delete key for life. It would be nice if, in that inevitable driving moment when I see a Police car up ahead, look at my dash and realize, too late, that I am going way too fast , I could just click ‘delete’ and the officer would magically disappear, reappearing, of course, somewhere else. Somewhere pleasant and useful, like a coffee shop, or a crosswalk. It would be great, in the midst of an argument, to have a delete key. A way to call back that horrible thing I just said, that I didn’t mean. I was just angry and careless and oh no, its out. Delete! and all the damage gone with it. Or what about those moments you’d like to erase for others? The skinned knee, the failed test, the broken heart? But then, if we never fall, can we learn to get back up? So maybe best not delete those. Or could we keep the lesson while erasing the pain? I don’t believe we could. Pain is a great reinforcer of things we already know, but would like to ignore. 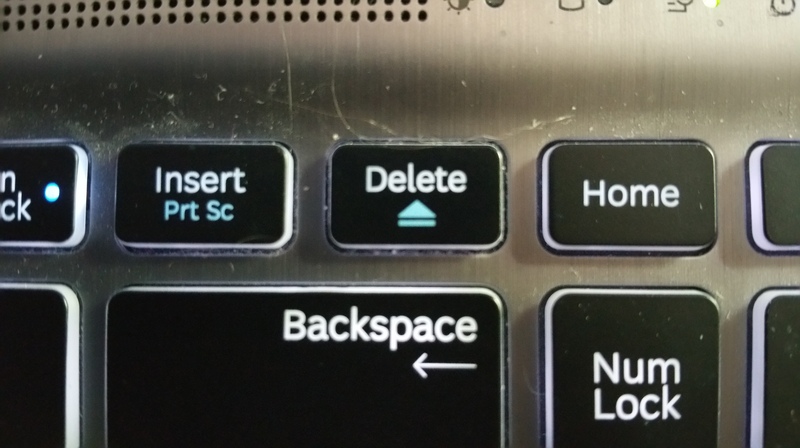 A delete key would eliminate the reiteration, the repeated lesson, the impact and allow us to continue, unimpressed by the agony of our mistakes. Then again, according to the theory, if we hit delete, then the mistake never happened and the lesson is unnecessary. Theoretically. But it seems like we would waste an enormous amount of time in deleting and remaking those same mistakes. Time that would have to come from somewhere. From building and creating, I suspect. And the point is probably moot anyway, because the stuff you delete is still there. All you have to do is hit “undo” and it reappears. A sort of deleted deletion. The results of our mistakes are always there waiting for us. Even if we put them in a box and tape the lid shut, we can’t seem to throw them away. Since my delete key was taken from me, I’ve been substituting alternate methods. Highlight-and-retype is fun, and Backspace-and-redo is viable. Both of them work, though I have to think about the mistake I’m erasing and come to conclusions about how to do better with my do-over. And maybe that’s not all bad. Maybe I’ll leave my delete key unfixed.